After more than 20 years of obsessive research and testing, America’s Test Kitchen has literally written the book on how to master your kitchen. Logically organized and packed with step photography, this will be the ultimate one-stop resource for both shopping and cooking. Have you ever wished that your kitchen came with instructions? Let the experts at America’s most trusted test kitchen show you the ropes in this new illustrated compendium of techniques, tips, tricks, recipes, and reviews for the home cook. This is a handbook for everyone, beginner to expert, that is not only useful but also entertaining, thought-provoking, and utterly unique. It will appeal to longtime fans of the magazine who want to see behind the scenes as well as to novice cooks who want to get everything right in the kitchen from the beginning. 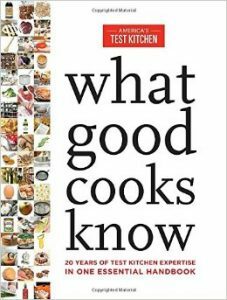 Never before has America’s Test Kitchen revealed the secrets behind our extensive testing procedures and exacting recipe development process; in this new book, come behind the scenes to see how we pick the best equipment and ingredients and create the most foolproof recipes out there. With dozens of equipment recommendations, hundreds of ingredient entries, mini lessons on basic cooking skills and useful kitchen science, plus illustrated step-by-step instructions for 50 of our most essential recipes.